Computers have evolved enormously over the past decade by becoming smaller and smaller. We are carrying tiny but powerful computers in our pocket. To be used on the street on the go, to communicate, view entertainment or to augment the world around us. Screensavers have evolved too. Growing from 320×240 pixel resolutions to bigger than life sized animations manifesting in the skies surrounding us – when there is no augmenting reality to be experienced, that is. 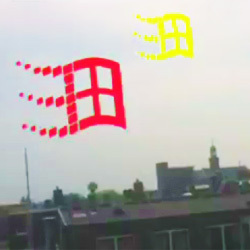 Sander Veenhof (Netherlands, 1973) is one of the members of “Manifest.AR”, an international collective of artists working in the augmented reality domain. Installing their work virtually, at a distance, and without the need for them to be physically present anywhere, their works defy borders, physical boundaries or any thinkable limitation of whatever kind. The MoMA museum New York uninvitedly hosts a Manifest.AR exhibition, there are virtual objects inside the Oval Office and Pentagon, and from August 5th on, the global augmented reality sky now has a screensaver. Manifest.AR is everywhere! Even when they’re not.